About This Series: As a part of the Virginia Discovery Museum’s partnerships with researchers at UVA, we’re featuring occasional blog posts about their research in child development and learning. Our first post is from Dr. Jamie Jirout, a professor in the Curry School of Education, who does research in spatial thinking. Spatial thinking is how we understand objects in space, such as physical attributes, relationships to other objects, and how things move and change. 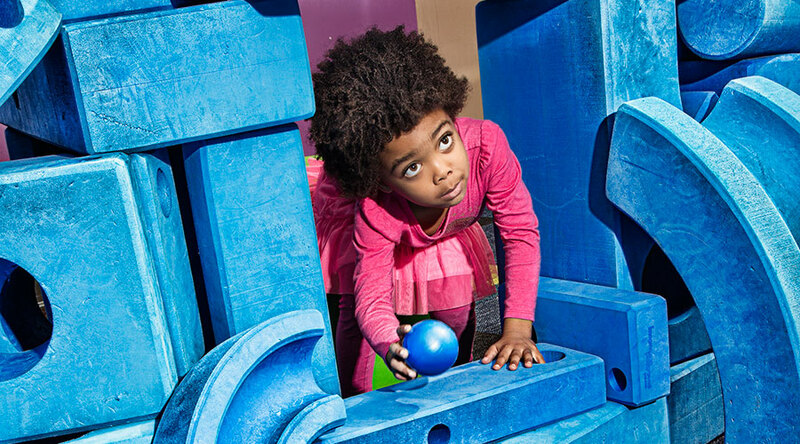 Give your kids a fun and educational playtime while helping us learn more about children’s spatial learning! 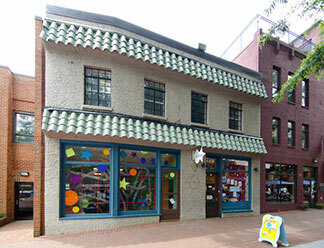 The Virginia Discovery Museum is excited to introduce a new weekly program for 2017 called Spatial Games Club in collaboration with the UVA Curry School of Education. These playgroups, which are included with Museum admission, will take the place of Kids Club on Wednesday afternoons in Creation Station. Kids Club will move exclusively to Thursdays from 4:00-4:30 p.m. for 2017. For more information about the Spatial Games Club, email Jamie Jirout or Kaitlin German or call the Museum at (434) 977-1025 x104. Importantly, research shows that these skills can be improved, and children are expert learners. So what should parents do? Provide opportunities for children to play with toys that get them to think spatially. Traditional toys like jigsaw puzzles and blocks are both extremely spatial, and construction toys like Legos, K’nex, circuit kits, Lincoln Logs, and more are also great for spatial thinking. You can even come up with your own activities: find ways of folding paper into different shapes to decorate a room; practice making your own maps of your house or neighborhood, or for pretend treasure hunts; go shape hunting and see how many variations of different shapes you can find. Add some spatial thinking to your reading time with books like, When a Line Bends, A Shape Begins or Lucy in the city: A story about developing spatial thinking skills – even classics like Go Dog, Go! include spatial talk. Once you start thinking more about it, you’ll realize that you use your spatial skills constantly – make sure your kids are getting the same practice by including spatial toys and activities to their playtime! Bus, A.G., De Jong, M.T., and Van Ijzendoorn, M.H. (2007) Social aspects in language and literacy learning: Progress, problems, and interventions. In: Saracho ON and Spodek B (eds) Contemporary perspectives on social learning in early childhood education: Volume 4. Greenwich, CT: Information Age, 243–58. Hart, B. and Risley, T. R. (1995). Meaningful differences in the everyday experience of young American children. Paul Brookes, Baltimore, MD. Hirsh-Pasek, K., Adamson, L., Bakeman, R.,Golinkoff, R.M., Pace, A., Yust, P. & Suma, K. (2015). The contribution of early communication to low-income children’s language success. Psychological Science, 26, 1071-1083. Verdine, B. N., Golinkoff, R. M., Hirsh-Pasek, K., & Newcombe, N. S. (2014). Finding the missing piece: Blocks, puzzles, and shapes fuel school readiness. Trends in Neuroscience and Education, 3, 7-13. Jirout, J. J., & Newcombe, N. S. (2015). Building Blocks for Developing Spatial Skills Evidence From a Large, Representative US Sample. Psychological Science, 26(3), 302-310. Levine, S. C., Ratliff, K. R., Huttenlocher, J., & Cannon, J. (2012). Early puzzle play: A predictor of preschoolers’ spatial transformation skill. Developmental Psychology, 48, 530–542. Wai, J., Lubinski, D., & Benbow, C. P. (2009). Spatial ability for STEM domains: Aligning over 50 years of cumulative psychological knowledge solidifies its importance. Journal of Educational Psychology, 101, 817-835. Newcombe, N. S. (2010). Picture This: Increasing Math and Science Learning by Improving Spatial Thinking. American Educator, 34(2), 29. Uttal, D. H., Meadow, N. G., Tipton, E., Hand, L. L., Alden, A. R., Warren, C., & Newcombe, N. S. (2013). The malleability of spatial skills: a meta-analysis of training studies. Psychological bulletin, 139(2), 352.